It's been a fun couple of fiber weeks for me, I've been knitting and spinning for the shawl I'm knitting. 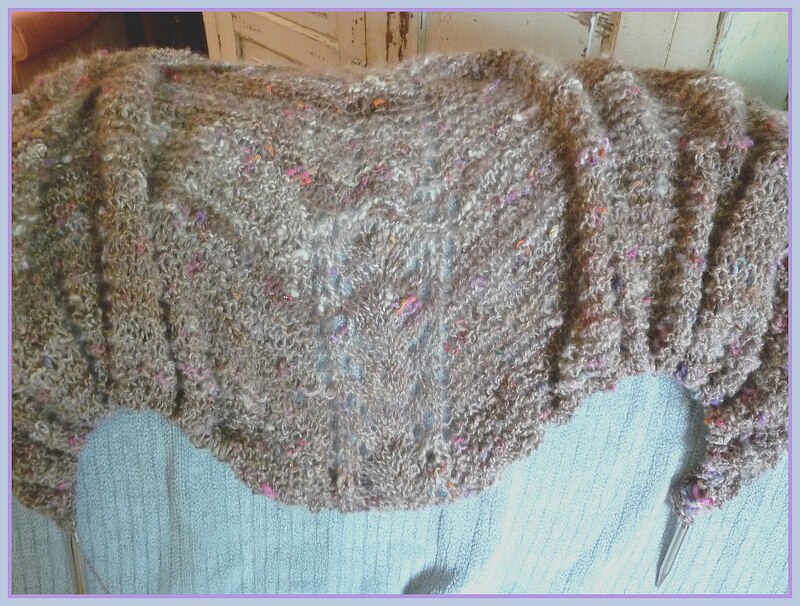 I'm using the Multnomah pattern, with just a couple of modifications. I knitted it using large needles, I prefer more of and open stitch and, in this case it's more complementary to my hand spun. The yarn I'm using is my Sequoia with Mix-Ins. As I progressed with the knitting, I could see that I would be needing some more, so I began the process of scouring and blending/carding and spinning more fiber. I "mixed" up enough for two more skeins, one has already been spun, I'm saving the other for a future project. 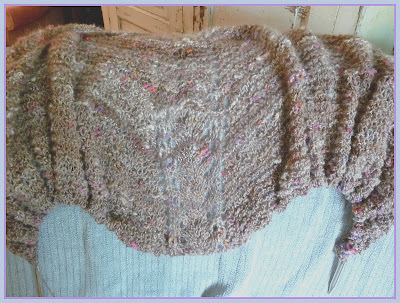 I'm nearly done knitting this, I am just about to begin the feather and fan border, which I'm planning to knit in different shades of my hand dyed/hand spun. It wont be long now. I love this pattern, it's a very simple knit, though I did alter it slightly by adding a simple lace pattern in the center, it's perfect for showcasing the pops of color in my hand spun. In addition to the shawl, I've been scouring and dyeing fiber for my next project. I'm calling this Seven Shades of Pink. 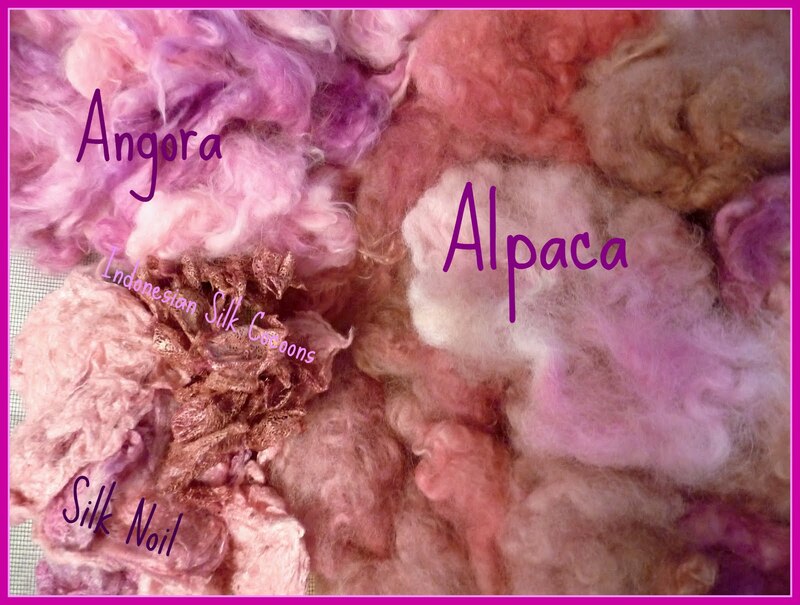 I've been dyeing up fiber like mad, today it is all dry and has been fluffed and is ready for blending. All the fibers were dyed using the same seven shades, but because of the difference in fiber, it made for a nice variation in the pallet. That's what I love about dyeing, I was able to examine each of the locks as I fluffed the fibers for spinning and every lock tells it's own little color story. My plan is to blend the fibers shown above with some other pretty tid-bits. When it's all spun up, I will be able to see how the yarn wants to be knitted. It's such an enjoyable process!!! It's a gorgeous day, the sunshine is calling me outside! Blessings Friends! Little Acorns are popping up!